This blog post focusses on explaining the real issue around the health and safety of lead crystal glassware. Despite the roumors about crystal causing a health risk to consumers, there has been no scientific evidence given to support this thesis. The lead content in our everyday diet and the environment is higher than when we consume from crystal decanters. 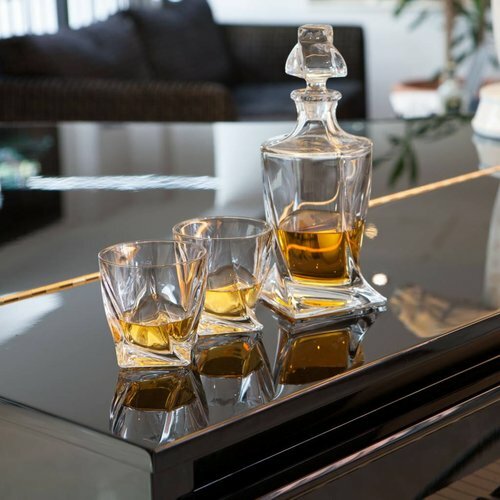 It is safe to consume from crystal glassware provided you don't store your spirits for months in them. Crystal is loved by so many of us around the world. It is luxurious, it sparkles and is practically colourless in comparison to ordinary glass. Standard glass has been made for thousands of years from silica-sand, potash, and limestone since Roman times. The method of cutting glass became an art form and led to the development of fine crystal products made around the world. Since then, multiple companies have used this same process but slightly different components to create fine stemware, dishes, jewelry, and collectible items from crystal. But for some, warnings about lead content have begun to make owners question whether their crystal glasses are safe for use, or if drinking from them poses health risks. 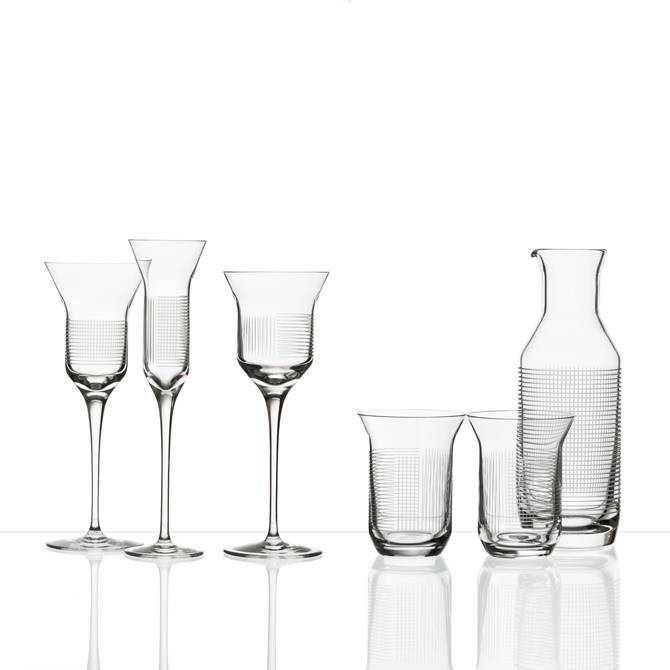 This guide is designed to explain these concerns and give buyers of crystal peace of mind when shopping for stemware and glasses. You might have read in our previous blog posts that crystal, as well as champagne, was invented in England. The pioneer of this discovery was George Ravenscroft. In the 1600s - an English businessman in the import/export and glass making trades. Mr. Ravenscroft first established a glasshouse in London and then began adding lead oxide to the glass. He later applied to King Charles II for a patent in 1674 and patented his process for the crystal product first known as flint glass. It wasn’t lasting long until five years later the factory dissolved and in 1681 his patent expired. Ravenscroft found that the addition of lead to glass during the melting process improved the quality of the glass. Technically speaking, lead glass is relatively soft and easier to cut, and its high refractive index gives it a brilliance that can be exploited by decorating the surface with polished wheel-cut facets. Crystal is one of the most precious materials, just after diamonds, gold or precious stones. It is essentially a leaded glass. According to a European guidance, you can call a crystal, only glass which contains at least 24% of lead. Many manufacturers or retailers call fine glass a crystal even though it has less than 24% lead. However, the truth is that any glass that contains over 10% lead but less than 24% should be called a crystal glass or fine glass. If you, therefore, intend to buy crystal ware check on the packaging whether and how much lead it contains. Generally speaking, any glass with the addition of Lead Oxide (PbO) is called crystal. Nevertheless, the composition must contain 24% or more lead oxide to be called full lead crystal. It is generally accepted that 24% lead crystal is the optimum percentage of weight, durability, and clarity. Furthermore, the crystal can consist of up to 35% lead – the more lead, the more sparkle, and ping. The higher the lead content, the more difficult it is to form the crystal during blowing. Lead content makes crystal dense, providing a much lighter index of light refraction (refractive index) than normal glass, and consequently much greater “sparkle”, exceptional colour and brilliance. A so-called “lead-free crystal” is essentially fine glass without the lead content. On this occasion lead is substituted with another ingredient, for instance, zinc, barium and potassium to allow the piece being heavy, transparent and possible to be hand cut or engraved. When lead crystal beverage containers are used in an ordinary way, they do not pose a health risk! Lead leaching is an occurrence in leaded glass, but the quantity that leaches into a glass of wine or other beverage let stand for a few hours is much smaller than the quantity of lead consumed daily in the ordinary diet. 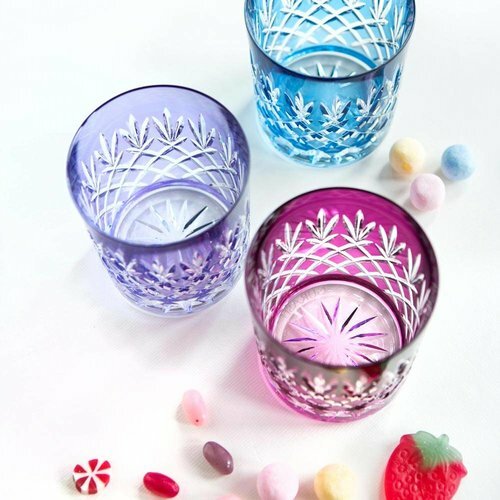 Therefore, food or beverage consumed from crystal glassware are completely safe! You can safely use your crystal stemware and barware to serve wine, water and other beverage. No liquid stays in the glass long enough during any meal to leach lead that exceeds any EPA standards. 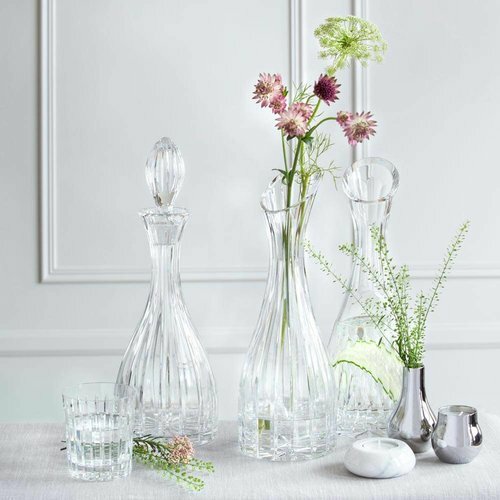 To make sure crystal glassware is safe to store liquids – no matter is manufacturer has done this already or not – perform this simple task: Fill the interior of your crystal glassware, decanters, and pitchers with white vinegar and let sit for 24 hours. Rinse well before use. The majority of lead oxide molecules will leach into an acidic solution, leaving the top layers of crystal virtually lead-free. The beauty of fine crystal has been admired for centuries. Despite the recent studies showing that percentages of lead can leak into liquids stored in lead crystal, that does not mean owners have to throw out the crystal stemware they have come to enjoy. Those who may be concerned about even minuscule levels of lead may prefer to buy beautiful glass stemware instead. 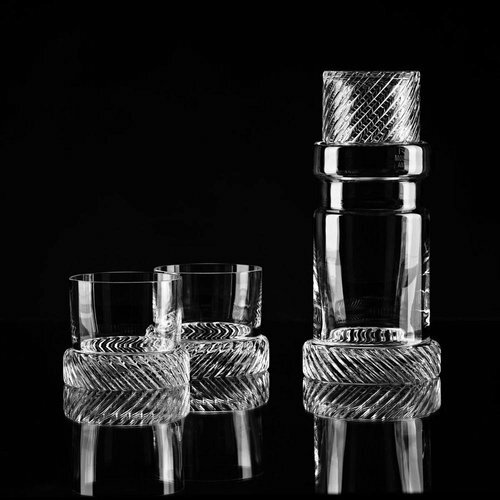 However, crystal stemware and decanters are perfectly safe for everyday use and do not harm consumers. For complete safety, and to avoid any health issues, do not store Cognac or port in a crystal decanter or store jam in lead crystal jam pots for weeks. 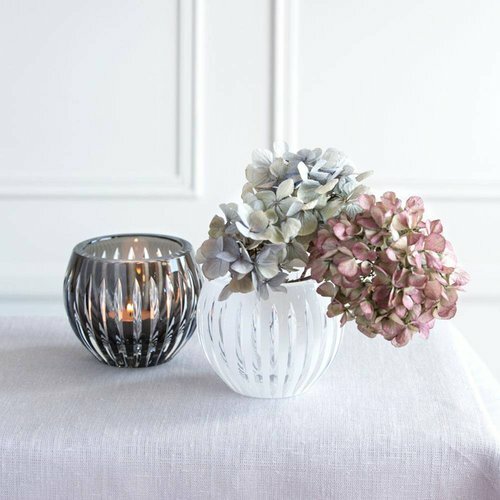 Beautiful decanters, stemware, dishes, and pots can be found on Gurasu and shipped directly to your home. Then, you can serve, enjoy the beauty of the container, and return the spirits to their regular containers.